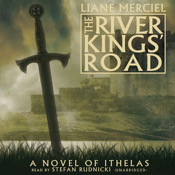 THE RIVER KINGS' ROAD by Liane Merciel (unabridged) is presented by Blackstone Audio and comes with what is perhaps the best audiobook app available (see FEATURES, below). A fragile period of peace between the eternally warring kingdoms of Oakharn and Langmyr is shattered when a surprise massacre fueled by bloodmagic ravages a Langmyrne village, killing its inhabitants—including a visiting Oakharne lord and his family—and leaving behind a scene so grisly that even the carrion eaters avoid its desecrated earth. But the dead lord’s infant heir has survived the carnage, a discovery that entwines the destinies of a mercenary who rescues the helpless babe and a Langmyrne peasant he enlists to nourish and nurture the child as they travel a dark, perilous road. •EXPERIENCE. About 11 hours of narration. Created as a Folium enhancedAudio™ edition, this book includes extra functions and features not found on lesser players. RATING: Suitable for adults who enjoy tales of fantasy and magic.